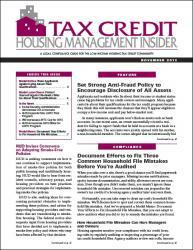 Tax Credit Housing Management Insider is the only online resource that shows your management team how to comply 100% with tricky IRS, HUD, and state agency rules. Get plain-English explanations of the tax credit rules, and avoid compliance mistakes that could jeopardize some—or even all—of your site’s tax credits. 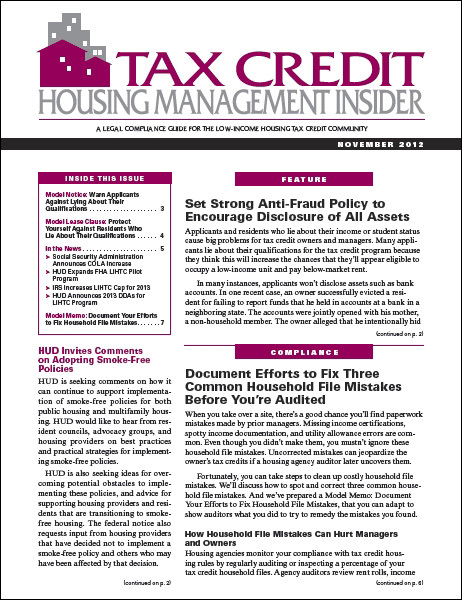 PLUS…Tax Credit Housing Management Insider provides useful, downloadable Model Forms, Notices, Agreements, and Lease Clauses—all ready to use as-is or easily adapted for your site’s specific needs. Monthly eAlerts giving you affordable housing news and trends, as well as quick tips for compliant, cost-efficient site management.